I shall never forget my first journey to Lubavitch. The weeks following Passover of 5592 (1832) were filled with excitement and joyous anticipation. I was six-years-old at the time, and I had just been told that father planned to take me along on his annual Shavuot trip to Lubavitch. I was scheduled to soon begin my studies at the cheder and father wanted me to receive the Rebbe's blessings for success in my studies. On a Sunday morning, mother woke me early and told me to hurry and dress. With a special joy she packed the new suit which she had sewn for me, warning me to wear it only on Shabbat and on the evening that I would merit to enter into the Rebbe's room. We then set out for the home of Rabbi Eisel, the rabbi of my hometown Homel, from where we would depart on the holy journey to Lubavitch. Despite the early hour, Rabbi Eisel's street was as crowded and noisy as on market day. The rabbi's courtyard was jammed with men, women and children, some excitedly talking in groups, others dancing. Four wagons stood by at the ready. To enter the rabbi's home is impossible—the house is crammed with people—and mother cannot locate father. We are told that Rabbi Eisel had delivered discourse after discourse of Chassidic teaching throughout the night, and that at first light those present had recited the morning prayers. Now, the scholars and wealthy businessmen of Homel have arrived to see their Rabbi off on his journey. A short while later we hear the sound of singing. Suddenly, people begin to pour from the doorway and windows of the rabbi's house, their backs to the yard and facing the house, singing and dancing all the while. A wave of holy trepidation passes through those waiting in the yard. Soon Rabbi Eisel appears in the doorway. He blesses the crowd with words of parting and climbs on to the wagon. Mother sees father climbing on to the wagon after the rabbi, and calls out: "Yermiah! Yermiah! Take Avraham Berl! Don't forget Avraham Berkeh!" But her voice is drowned out by the commotion. Seeing that father has forgotten me I start to cry. The wagon in which Rabbi Eisel and father are sitting is already moving. The entire crowd bursts into song and begins to follow the wagon out of town. In the meantime, mother has located Reb Yisroel Aharon the melamed and has told him that father has forgotten me, and that she has called out to him but was not heard. Reb Yisroel Aharon lifts me into his arms and, forcing a path through the crowd, brings me to father's wagon. The wagons are proceeding slowly and the crowd is growing—at each street crossing hundreds more are joining the parade. And before those accompanying us from Homel have turned back, already the delegation from Belitza is coming towards us to greet the Lubavitch-bound procession that is passing through their town. At Belitza everyone gets off the wagon and proceeds on foot. But I, fearing that father would again forget me, remain on the wagon. We have set out from Homel in four wagons, a pair of horses harnessed to each, each carrying some fifteen chassidim: several sit in two rows inside the wagon, others along its sides, two on its steps, and another two up on bench alongside the wagon-driver. I sit in the first wagon with my father, a successful businessman who was financing the entire trip, opposite the great Rabbi Eisel. All are joyous, merry, and with ebullient hearts. The wagons merely serve as a resting place for an occasional hour or two, for the chassidim make their way largely by foot, with a pleasure and joy that is simply indescribable. For five days we journey from Homel to Lubavitch, from Sunday to Thursday. We pass through large and small towns, villages and settlements. Wherever we go, we are met with joy and festivity. 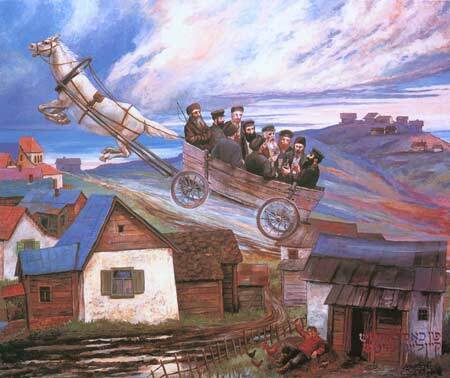 In our journey we are joined by other wagons headed to Lubavitch: wagons from Babroisk, Shtzedrin, Smilain, Tultshin, Minsk, Barisov, Zhlobin, Shklov, Ragatshov, and many other towns. We are also joined by groups of foot travelers. On Wednesday afternoon we reach the settlement of Zalishkina where the chassid Rabbi Elya Moshe "The Successful One" lives, some 15 or 16 versts before the city of Dubrovna. In Zalishkina we find some twenty or thirty wagons, and hundreds of people spread about the spacious lawn across the road from Reb Eliya's homestead. They are clustered in groups, talking, sleeping, eating, discussing Chassidut, or dancing. I hold on to father's coat lest he forget me. Reb Elya Moshe, his sons, sons-in-law, wife, daughters, daughters-in-law, grandchildren, brothers, sisters and their families, all have their hands full serving the chassidim traveling to Lubavitch, providing them with food and drink—all free of charge. And Reb Elya always says: "Of all that the Rebbe accomplished for me up above, ninety-nine percent belongs to the chassidim, one percent to myself. Eat, my brothers, and drink, for it is the blessing of the Rebbe and the generosity of the Almighty that you are enjoying. Eat, drink, and gladden your hearts, so that you may be healthy and vigorous chassidim, with the strength to serve G‑d in Torah-study, the mitzvot, and the service of the heart." At Zalishkina we meet with the famed chassidim Rabbi Hillel of Paritch and Rabbi Betzalel of Zaritz. The tremendous joy of their meeting with Rabbi Eisel defies description. The three eat together at the home of Reb Elya Moshe. We leave Zalishkina with forty wagons and armies of foot travelers, each with a bundle on his shoulders and a walking staff in hand. They sing as they walk, and those in the wagons answer in song. Our road now passes through a forest, winding its way between the tall trees; so long does the line of singers stretch, that one hears those at the forest's edge repeating the stanzas already sung by those walking ahead. Far ahead I see the end of the forest. There the sun is shining, but here the leaves block the light of day as if the sun has already set. Soon we emerge from under the forest thicket into a broad, sunlit field. Before us rises a large hill. At this point the riders all climb down from the wagons and proceed on foot, except for Rabbi Eisel, the elderly chassid Rabbi Yechiel "The Tearful One," and Rabbi Zalman Dov "The Milkman." When we reach the top of the hill, the homes and gardens of Dubrovna come into view, although the city is still more then two versts away. Along the downslope of the hill a large crowd lines both sides of the road, and we are told that the chassidim of Dubrovna, headed by the renowned Rabbi Nechemia, are coming to greet the journeyers to Lubavitch. When we reach the point where the delegation of Dubrovna's chassidim await us, Rabbi Eisel climbs down from the wagon to greet Rabbi Nechemia. Father accompanies Rabbi Eisel, and entrusts me to Reb Avraham Meir the coachman, commanding me to obey his instructions. The next thing I know, it is Thursday morning in Dubrovna: the trip has finally exhausted me, and I was fast asleep by the time we arrived in Dubrovna the evening before. Reb Avraham Meir has already breakfasted, and he informs me that in an hour or two we set off to Lubavitch. That evening, we arrive in Lubavitch. On Friday, an hour before sunset, the large synagogue in Lubavitch is already filled to capacity with chassidim. On the pulpit in the center of the synagogue stand the Rebbe's sons and several chassidic elders, including Rabbi Eisel. Soon word arrives that the Rebbe is coming. Silence falls, and all eyes are raised to the place where the Rebbe will appear. From my vantage point atop one of the ovens, holding tightly on to Reb Avraham Meir's hand, I see a man dressed in white, with a fur hat on his head, making his way to the chair that has been prepared for him on the pulpit. In a powerful voice he begins to speak: "And G‑d spoke... Uplift also the heads of the sons of Gershon..."
I remember how father and I entered into yechidut with the Rebbe. Father waited many hours in the anteroom; myself he placed on the window sill. When the fortunate moment came to be received by the Rebbe, father called to those who stood with him in the crowded room to fetch me; over the heads of the chassidim I sailed, passed from hand to hand, until I reached my father. Father then entered the Rebbe's room, myself following, clutching tightly at the tail of father's coat. The Rebbe's room was large, with book-filled cabinets lining its walls. He sat at a large table, covered with books, notes, letters, several containers filled with coins, and two lighted candles. When father entered, the Rebbe lifted his eyes from the book which lay open before him and gazed into father's face and then into mine. Father's entire body began to tremble; I, too, was overwhelmed and began to silently weep. The Rebbe reached out his hand to receive the note held by father, who, in his terror, stood frozen in his place, at a total loss as to what to do. Father stood silently, his head bowed, and teardrops fell from his eyes on to the floor. At first he managed to control himself and weep in silence, but after a short while he burst out in sobs. Father's sobbing crushed my heart, and I wept silently, and gazing at the Rebbe's face. The Rebbe read father's note twice and then a third time, all the while looking at our faces. Then he spoke to father for a long while. When the Rebbe began to speak, father stopped crying. Father's lips moved all the while as he silently repeated the Rebbe's words so that he would remember them. When the Rebbe finished, father asked him several questions, which the Rebbe answered. Then father said to the Rebbe: "My son is beginning cheder, with the help of the Almighty. I ask the Rebbe to bless him." He drew me close to the Rebbe. The Rebbe closed his eyes and sank into deep thought. When he opened them, he looked at me and said: "Be studious and do not waste your time. May G‑d help you to be a scholar and a chassid." "Amen," answered father, and I after him. As soon as we left the Rebbe's room, father lifted me in his arms and joined the dancing chassidim in the small adjoining synagogue. For so was the practice in those days: everyone who was privileged to be with the Rebbe in yechidut would join the dancing as soon as he emerged from the Rebbe's holy presence. For a long while father danced, until his clothes were soaked in sweat, as if they were pulled from a basin of water. Finally, he sat down on a bench in the corner of the synagogue to rest for a while. I saw that father is in an elated mood: although he is exhausted, still he claps his hands and stamps his feet in time with the dancers; every so often, he snaps his fingers and lets out a thin, powerful whistle from his lips, a whistle which encourages those tired by the dancing, propelling them even faster in the dance's circles and whorls. The dancing of chassidim was familiar to me from the many farbrengens that were held at our home, during which Reb Shlomo Peshe's would lift me on to his shoulders. Still, I wondered: why do chassidim dance after coming out of the Rebbe's room? Another question was also troubled my mind: why is the audience with the Rebbe called yechidut? For so I heard the chassidim talking, "Have you been in yechidut? ", "Thank G‑d, I've been in yechidut", or, "So and so is waiting for a yechidut." Seeing that my father was in a good mood, I asked him the two questions that were giving me no rest. Said father: "Do you know about the Sanctuary built in the desert by Moses at G‑d's command? Do you know about the special room in the Sanctuary which housed the Ark containing the two tablets upon which were inscribed the Ten Commandments? And do you know that once a year, Aaron the High Priest would enter this holy chamber to offer the ketoret and pray for the Jewish people? I was eager to show father how much I knew: I explained also about the Holy Temple built by King Solomon in Jerusalem, which also housed a Holy of Holies, the Ark, and the Two Tablets. I described the service of the High Priest on Yom Kippur, his entry into the Holy of Holies, and how when the High Priest uttered the Holy Name of G‑d the entire crowd in the Temple courtyard would kneel, bow and prostrate themselves. With my mouth I explained and with my entire body I demonstrated exactly how the people would bow on Yom Kippur. Twice already I had been to the synagogue on the Holy Day, and when everyone bowed I did just as the grownups did and then ran to tell my mother, who gave me a slice of white bread without butter, explaining that it is a holy fast day. "Who entered into the Holy of Holies with the High Priest?" father asked me. "No one," I said, "he went in alone." "What did the High Priest do," asked father, "when he finished performing the services of the Holy Day?" "Our teacher Rabbi Elimelech told us" I replied "that the High Priest was very rich and he had clothes of gold. He would make them out of the gold in his house. When he finished performing the services in the Holy Temple on Yom Kippur he would go home, and all the Jews would accompany him, singing all the way. When they arrived, they found his courtyard set with tables covered with all kinds of food and drink, and they would celebrate with great joy because their sins had been forgiven." "And today?," continued father, "do we now have a Temple with a Holy of Holies?" "Today we have no Temple and no Holy of Holies" I replied with a heavy sigh, my eyes anxiously uplifted to father's, awaiting his response. But before I could swallow, a group of chassidim burst into the small synagogue, singing and dancing. Father, upon seeing that they were mostly from Homel, jumped up from his seat, arms outstretched and feet advance, and joined their whirling circle. I wanted to rush after father, but fearing that I may be trampled, I drew back and climbed on to a bench. I spotted Reb Avraham Meir the coachman among the dancers; when he passed me I called out to him, but he didn't hear me. From my bench, I watched the chassidim dance. Each danced with his eyes tightly shut, his right hand on his fellow's shoulder and his left moving in time with the rhythm of the song that issued from his lips in holy trepidation. Father danced in the center of the circle with several of the chassidim from Homel, including Reb Avraham Meir and Reb Shlomo Peshe's. I have no words to convey the sacred emotions which bathed the faces of the dancers; the love and the brotherhood, the joy and the ecstasy, defy categorization and definition. The dancing chassidim were held and fused together in fellowship and harmony, and my heart dissolved in yearning to join them. I kept calling out to Reb Avraham Meir as he passed, but he hasn't noticed me. Then, I felt someone grabbing me from behind; suddenly, I was sailing through the air and, a moment later, riding on the shoulders of one of the dancers. I peered down and saw that Reb Shlomo Peshe's is carrying me on his shoulders, and my joy know no bounds. A voice as thunder rings out: End of first round: time for minchah! This from Reb Zalman Yaakov Esther Dishe's, one of the wealthy and influential citizens of Homel. The dancing broke off for the afternoon prayers. Father's earlier words about the Holy Temple and the Holy of Holies and his last question--"And today, do we have a Temple, a Holy of Holies?" --left a trail of sadness and distress in my heart. I now remembered the stories which our teacher Rabbi Elimelech had told us last Tish'ah B'av, and a new question began to race through my mind: Why are they happy? Why this joy, if the Holy Temple lies desolate, and on the site of the Holy of Holies demons dance? I decided to ask father as soon as he finished praying minchah. After minchah, as Reb Zalman Yaakov Esther Dishe's was announcing the arrival of vodka and cakes, I posed my question to father. Father replied: "You ask well, my child. Indeed, nowadays we do not have a Holy Temple nor a Holy of Holies. "From the day the Temple was destroyed," continued father, "we await the day when we shall return to G‑d and He will have mercy upon us and send us Moshiach, our righteous redeemer. Moshiach will gather us from the four corners of the earth and take us, together with our homes and furniture, to the Land of Israel. He will rebuild Jerusalem and the Holy Temple with the Holy of Holies. "However, until that day, we are not alone. Lubavitch is our Jerusalem, the Rebbe's synagogue is our Holy Temple, the Rebbe's room is our Holy of Holies, and the Rebbe is the Ark which houses G‑d's Holy Torah." The sight of father's face as he spoke and the earnestness of his tone made an awesome impression upon me. I thought: Just now, father and I were in the Holy of Holies, and now we are in the Holy Temple. How awesome and frightening it is. Father's voice broke into my thoughts: "Did you know, my son, that when G‑d would speak to Moses, Moses would hear the Divine voice emanating from the Ark in the Holy of Holies"
"Yes, I know" said I. "I once heard how mother read this from a book to my aunt." "And just as when the High Priest would emerge from the Holy of Holies, he and all of Israel would celebrate and be joyful, so, too, we celebrate and are joyous over the great kindness which the Almighty has shown us by granting us the privilege to enter into the Holy of Holies and hear the Rebbe's blessing. "Remember well," warned father, "the blessing which you received from the Rebbe, and when we arrive home, G‑d willing, tell your mother everything." But before I had the chance to demonstrate to father that I remembered every word of the Rebbe's blessing to me, Reb Zalman Yaakov Esther Dishe's approached and steered father to the table, forcing him to partake of the vodka and cake. I also received a honey-glazed cake from father, upon which I recited the blessing, Borei minei mezonot, out loud. Reb Abba Dovid the cantor said to father: "You are wise to bring your Avraham Berl to Lubavitch. These days, children must be exposed to Chassidut from their very earliest years." "In my opinion," said Reb Baruch Shimon the bookbinder "the wisdom is hers, not his. She [meaning my mother] is truly a wise one, a true chassid." "I was with father in the Holy of Holies and the Rebbe blessed me," I told them, looking at father to see if I was allowed to relate the Rebbe's blessing to them. But father was deep in conversation with those who sat across the table from him. At this point Reb Shlomo Peshe's, drenched in sweat, ran in with the news that all the Homel chassidim have, thank G‑d, already been in yechidut. The final group was now praying minchah and will arrive shortly. "For bearing such good news," said Reb Zalman Yaakov to Reb Shlomo Peshe's, "you deserve a glass of vodka and a cake. Here, make a brachah and say l'chayim." From the Hebrew by Yanki Tauber. Painting by Chassidic artist Zalman Kleinman.